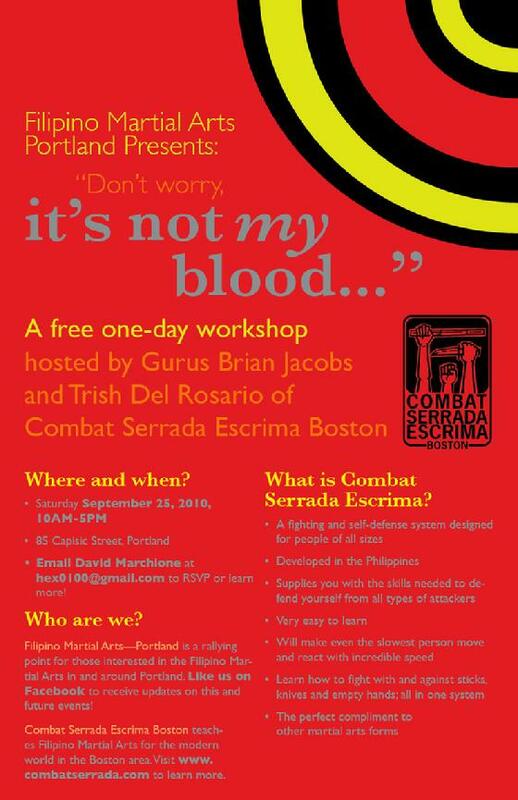 CSE-Boston's Guros Brian Jacobs and Trish Del Rosario will be holding a free workshop on combat Serrada Escrima, open to all ability levels on Saturday, 9/25/10, 10am to 5pm. CSE is an easy to learn and highly adaptive method of self defense and also makes an excellent compliment to other Martial Art Systems. You can also visit our page on Facebook: Filipino Martial Arts - Portland, Maine or CSE-Boston. "Don't worry, it's not my blood..... "